Wraps come off the second-gen Hyundai Creta/ ix25 at the 2019 Shanghai Motor Show. India launch expected early in 2020. 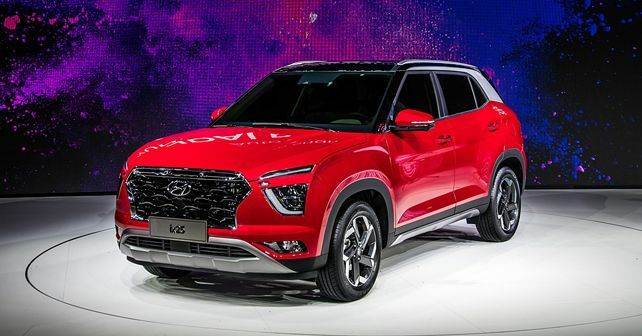 As Hyundai India prepares to drop the veil on its brand new sub-4m compact SUV – the Venue – tomorrow, the company’s Chinese counterpart has unveiled the second-gen ix25 SUV at the ongoing 2019 Shanghai Motor Show. Now, for the uninitiated, the ix25 is essentially the China-spec version of the Creta. So, what you’re seeing here is actually the next-gen model of Hyundai India’s most popular SUV. The first thing that stands out in the new ix25 is its exterior design. While the silhouette is more or less the same as the existing model, the design language has taken a completely new and rather edgy direction. The front-fascia is heavily inspired by the brand’s recently launched Palisade SUV, meaning it gets a signature cascade grille with a chrome shroud, split headlamps with LED daytime running lamps and a new bumper. The rear-end has been completely overhauled, and it now looks a lot busier, thanks to trapezoidal tail-lamps, a roof spoiler, a long stop light strip and multiple creases. Inside, the changes are even more pronounced as the new model gets a dual-tone interior that is highlighted by a large and Tesla-esque touchscreen infotainment system that’s stacked vertically. The steering wheel is also new and it’s a 3-spoke unit with multiple controls on it. The gear lever and the centre console buttons and knobs have also been redone and they look quite stylish and upmarket. Although details are sparse at the moment, the second-gen Creta will be longer, wider and more spacious than the current model. As for its powertrain, the India-spec model is expected to come powered by Hyundai’s new BS-VI approved 1.5-litre petrol and diesel engines. Like the current model, expect both petrol and diesel versions to be available in manual as well as automatic versions. There’s no official confirmation as to when the new Creta will be arriving to India. Our guess is that it’ll only come here early in 2020.